Mitakihara Magi fullback John Nelson is a chemistry major with a desire to work in pharmaceuticals if his football career doesn't pan out. Nelson, who was named captain in place of quarterback Reggie Miller on offense, is one of a number of seniors that will be honored on Magia Day 2052 at Mitakihara Stadium in Mitakihara Town, B.C. against the Wyoming Cowboys (kickoff: 6 p.m. PT/9 p.m. ET, City/TVA Sports/NHK/BBC/The Mtn.). When asked of his career as a fullback for the Rose, Pink and White, Nelson simply laughed and took it all in stride. "It's been fun, mostly," said Nelson, a native of Carrolton, Texas. "I'm from Texas, so I'm used to working hard and having fun all at the same time. I get calls from my dad in Carrolton and he talks about his job as one of the admins at SMU. He wanted me to come to SMU but I told him that I wanted to try something different, so I came to Mitakihara. "The atmosphere is great, the people are great, and there is a huge desire to win and win big. We haven't been winning as big recently, but we're still winning games. Sometimes our fans need to get used to close victories so that they aren't that bored with our style of play. "I've seen a lot of my players go down to injury. Losing Reggie for the season was really tough, and I think he may have ended his career playing football after he broke his elbow. Haruyuki [Arita] going down was also tough because that meant D.W. [Hinoi] was going to take over. Kid's a freshman halfback, and he's under center, and he's been great for us. "As for me, I do what I'm supposed to do: carry the ball and make key blocks. I've done my part to lead the Magi to a number of national championships and I would love to end my playing career with one more. I don't know if I'm going to be picked in the draft, but I am a versatile athlete that can play on offense and defense, so I do hope to get selected. "No question, I am going to miss Mitakihara University. 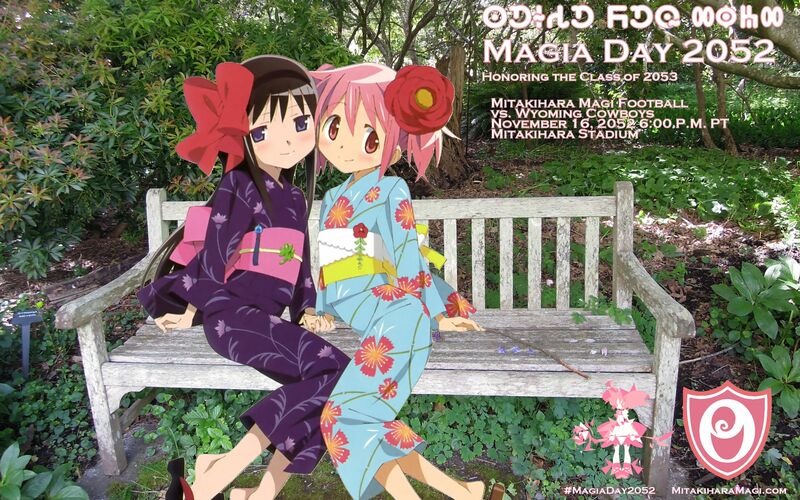 Madoka is a second home to me, the chancellor's a wonderful old lady and her brother is my coach. And once again, let me say it: the people, the teachers, the admins and staff...the whole campus is awesome. So, I want to finish my career on the right track and win another conference championship and another national championship with the rest of my seniors. It's the right thing to do."